Topola is a new version of the Quarks puzzle, developed by Fourier Idea. The puzzle uses the same sliding shell mechanism of the Quarks, so if you're familiar with it, Topola would be easier to understand. 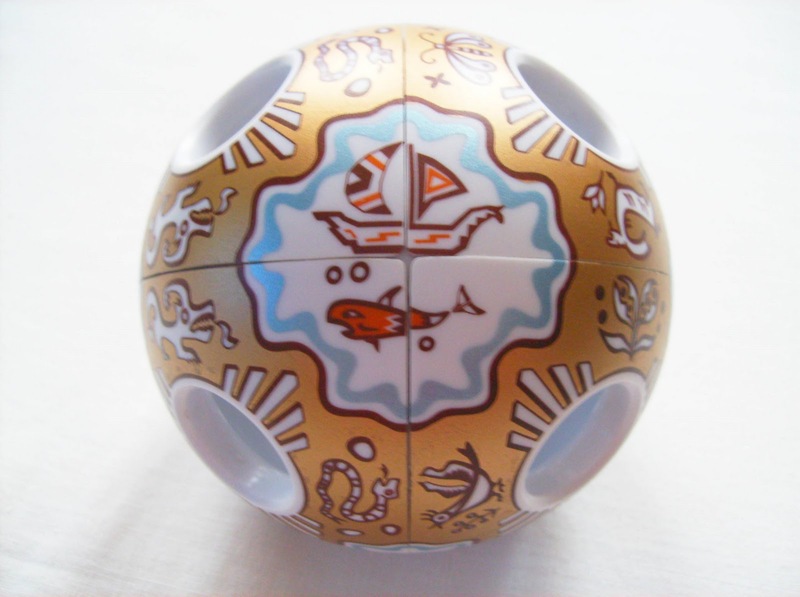 Just like Quarks, Topola is also hollow inside and you have eight holes to help you twist the puzzle. Regarding the difficulty of Topola, this is as hard as a 2x2 puzzle can get and much harder than the Quarks. You won't have any colors to guide you through the solving process, or arrows, like the Quarks, to indicate the orientation, either. As you twist the puzzle, some islands might be aggregated into the continents, or the ocean might become smaller, giving place to some lakes. Bottom line is that, you always have to be concentrated on the changing topology of the puzzle, as you "twist" your way around the globe and try to take one step at a time, without changing your surrounding environment in the process. The concept and idea behind Topola is brilliant! While taking the simple 2x2 concept and turning it into a wonderful solving experience, with the globe and topology changing design, it's a very clever use of the Quarks mechanism and leaves you wanting more designs like these. After being pleasantly surprised by the Quarks puzzle, it could prove to be difficult to be amazed by any "sticker variation", although the images were printed on the puzzle instead of using stickers (nice touch, by the way). You couldn't be wronger... By serving us with such an original and new idea, the inventors of Topola have created a totally different puzzle. The story used to create the challenges is very ingenious. From the way how you must capture the whale with your boat, how everything turns into chaos with your journey, to the way how you must return nature to its perfect balance again, is so well thought, that this is surely, a fantastic puzzle. I personally prefer this one over the Quarks, for its stunning visual appearance. Bravo! The Topola is available for purchase at the Fourier Idea website. The Quarks puzzle was developed by the company Fourier Idea and released in 2009. The design of the puzzle, which was inspired by the subatomic particles named quarks, is very original. The puzzle is formed by six colored quarks (representing its six types of flavors), with eight holes that have three different colors around them, "swirling" as if they were being swallowed by a Black Hole. Each quark is divided by four equal parts with an arrow, to help identifying its orientation. 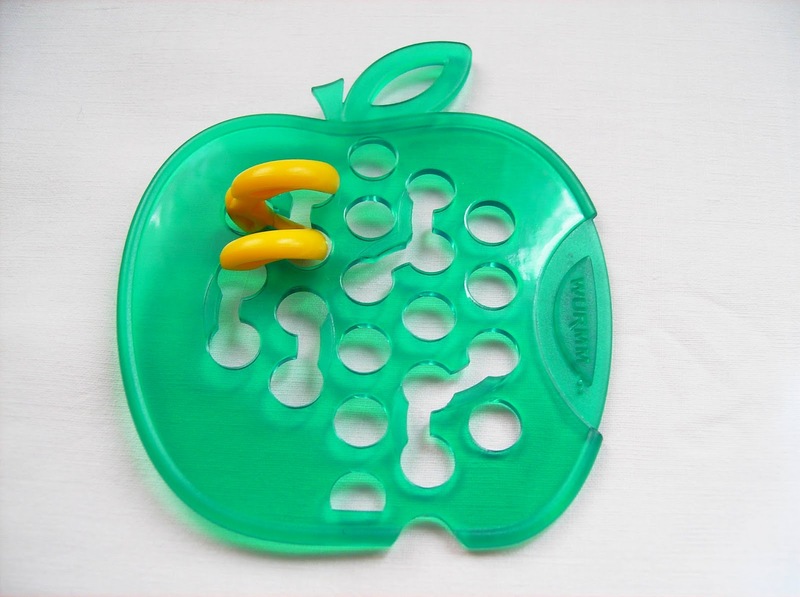 Another great design feature is that the puzzle doesn't have a core like its twisty cousins. It's completely hollow. 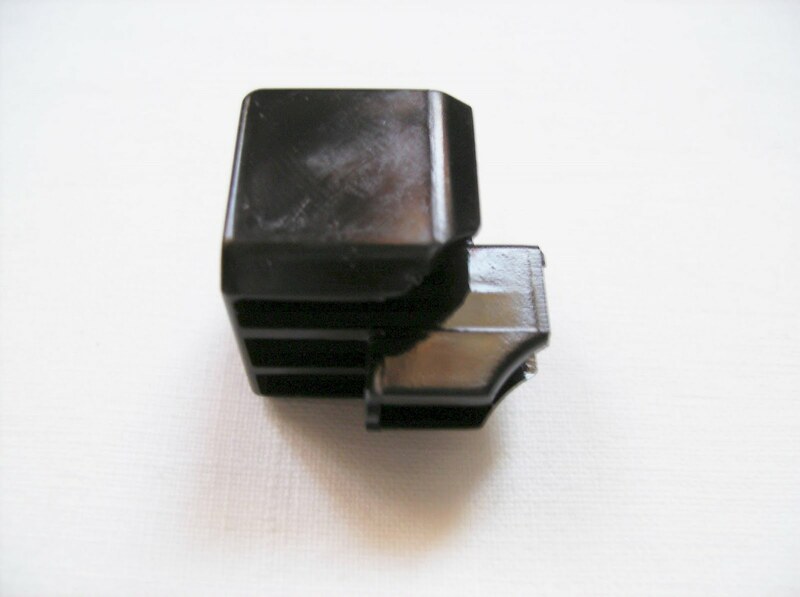 The pieces are held together by a patented sliding shell mechanism, developed by Fourier Idea. Now, as difficulty goes, it's not that hard, if you know how to solve a 2x2 cube. 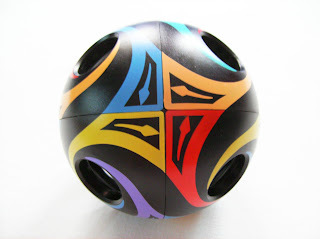 It may be a bit more difficult to solve it, because the puzzle is a sphere and could be harder to visualize the patterns, due to its coloring scheme. For any 3x3 cube solver, it's a breeze though, because you'll probably need just a couple of algorithms borrowed from the 3x3 cube. 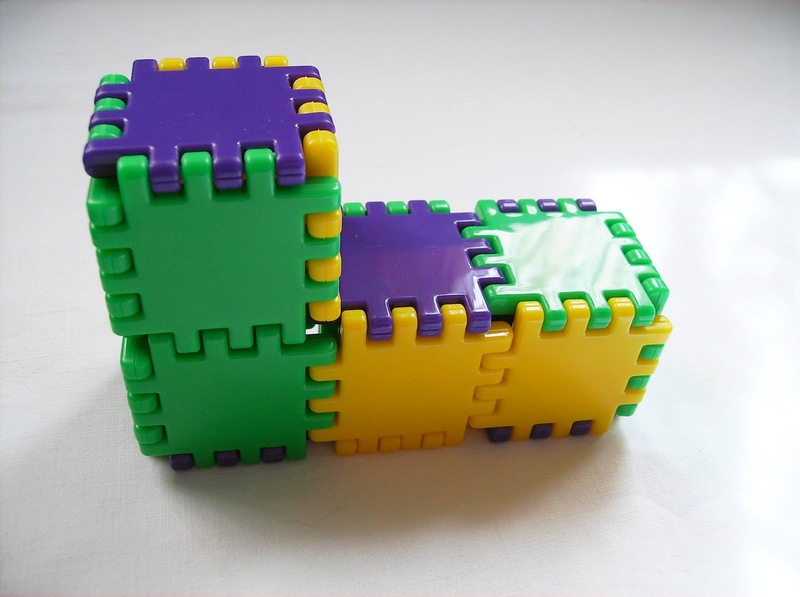 If you still get stuck at solving it, you can always take the puzzle apart and assemble it back to the solved state. Turning quality is ok, although it's not recommended for any kind of speedsolving. The pieces have to be perfectly aligned to rotate, but overall, it could be improved with a bit of lubrication. I was very pleased with the design features of the Quarks. When I first saw pictures of it, I didn't realize that it was hollow inside (this was one of the first pictures I saw of the puzzle). The colors and shapes used are visually, very pleasant to the eye. While it's not a hard challenge for an experienced puzzler, it's certainly fun and enjoyable to solve and definitely a great gift for any Rubik's Cube fan or a puzzle collector. The Quarks is available for purchase, directly from the Fourier Idea website and you can also make a wholesale order with a nice discount. Update (29 Feb. 2012) - In September 2010, I reviewed the Mirrorkal - You and Einstein. 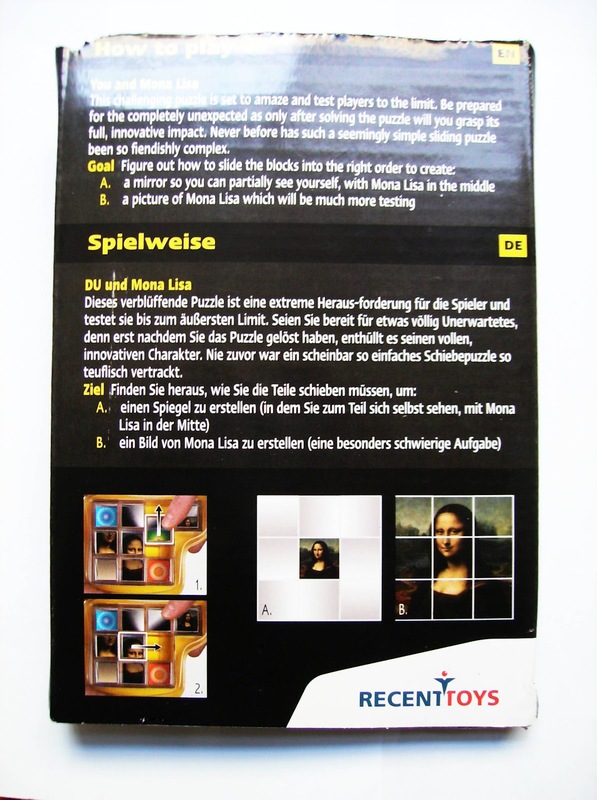 Since then, Recent Toys decided to discontinue that puzzle and changed it to the picture of Mona Lisa. The puzzle and its mechanism is still exactly the same, with the only change being the pictures themselves. Below, you'll find the original review with all links updated. Hope you enjoy the puzzle. Mirrorkal - You and Mona Lisa is an invention by Ivan Moscovich, and distributed by Recent Toys since 2009. The puzzle is a step up from the previous Mirrorkal Escher, where you have a 3x3 grid with nine cubes, each one made up of pictures and mirrors on each side (one mirror and three pictures for every cube, with different arrangements between pictures and mirror). This new version of Mirrorkal takes slide puzzles into another dimension, because it's not just a slide puzzle. You have to figure out where each cube goes before solving the final slide puzzle. There are two challenges available. Since it's not at all, easy to photograph a puzzle full of mirrors, I'll try to explain it as clearly as possible. Like the first Mirrorkal, this one also uses a 3x3 grid with nine cubes, each one with a mirror in one of four possible orientations and three pictures on the other remaining sides. Note that the upper and bottom sides of the cubes aren't used for pictures. The puzzle comes out of the box, solved with the bigger picture of Mona Lisa. Your goal is to slide the cubes, like any other 3x3 slide puzzle, and have the same picture, but smaller at the middle cube, with the surrounding eight cubes showing a mirror to see yourself. Before trying to solve the final challenge, the 3x3 slide puzzle, you have to study the configuration of the cubes to figure out how the mirrors interact with each other and where each one of them goes. 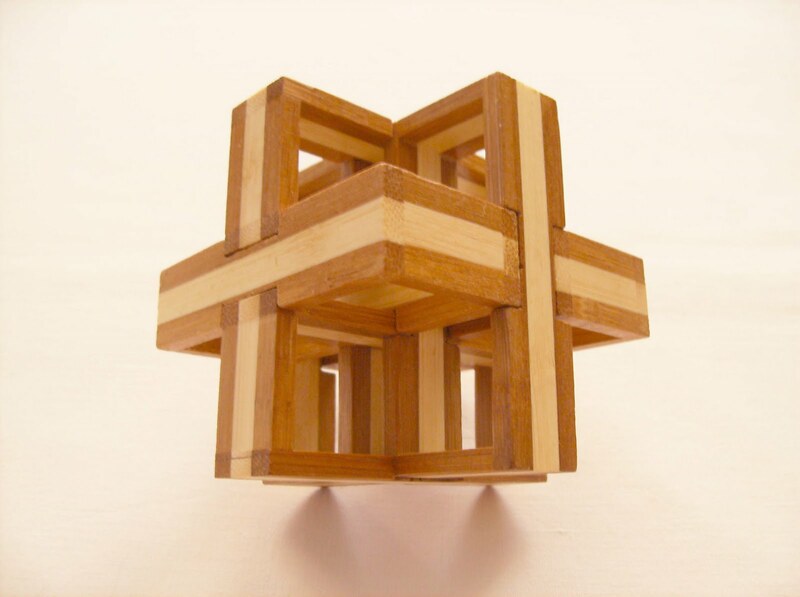 One tip to do this is that, you have to place each cube with its mirror facing the exact opposite in orientation. This will make each cube to reflect itself and this way, create the mirror effect around the middle picture. Watch out for parity problems. Since you have just four possible orientations for the mirrors, there are two possibilities for each 1-8 correspondent slide numbers. 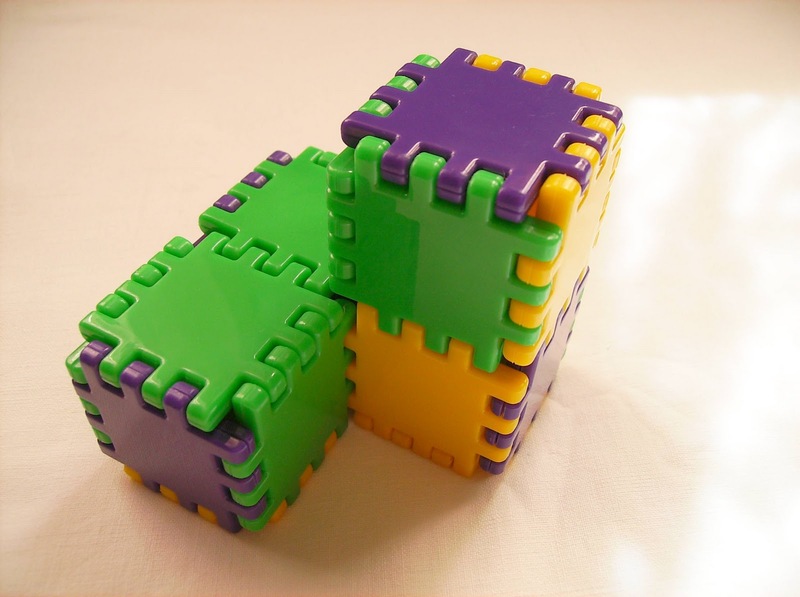 If you're having trouble to solve the slide puzzle, just switch one of the problematic cubes to another similar orientation one, until you find the solution. There's only one way to have all the cubes in the correct positions, so it may take you some time to solve it. The Mirrorkal - You and Mona Lisa is a great improvement of the first Escher concept. It takes a simple slide puzzle and with a new approach, turns it into a wonderful brainteaser. The use of mirrors to reflect images is a clever idea and the parity problems make it much harder than it looks. The result couldn't be more spectacular. If you can, get the two versions of Mirrorkal. It's definitely worth it. 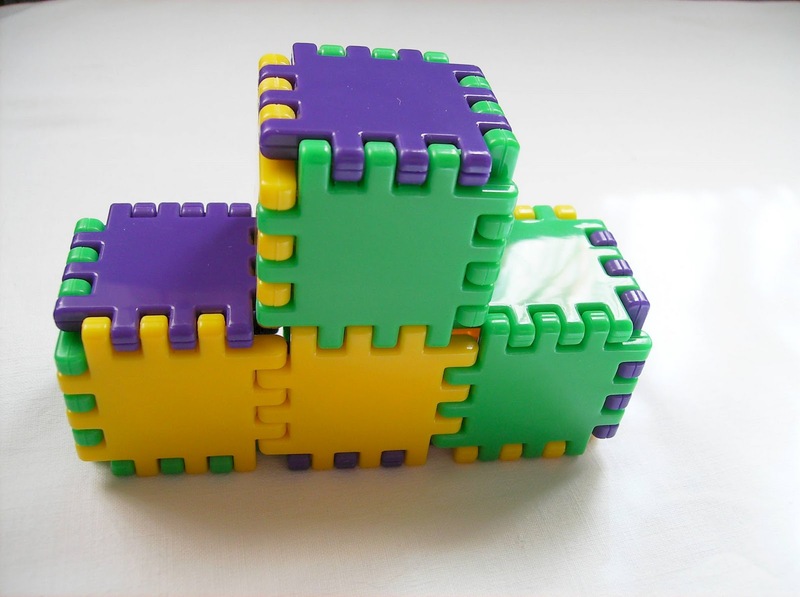 Created by puzzle inventor George Miller and distributed by Recent Toys since 2009, Cubigami7 is a Folding Puzzle. In 2005 it was entered at the 25th IPP Design Competition. At the time, the prototype was only in acrylic, as you can see from this photo. 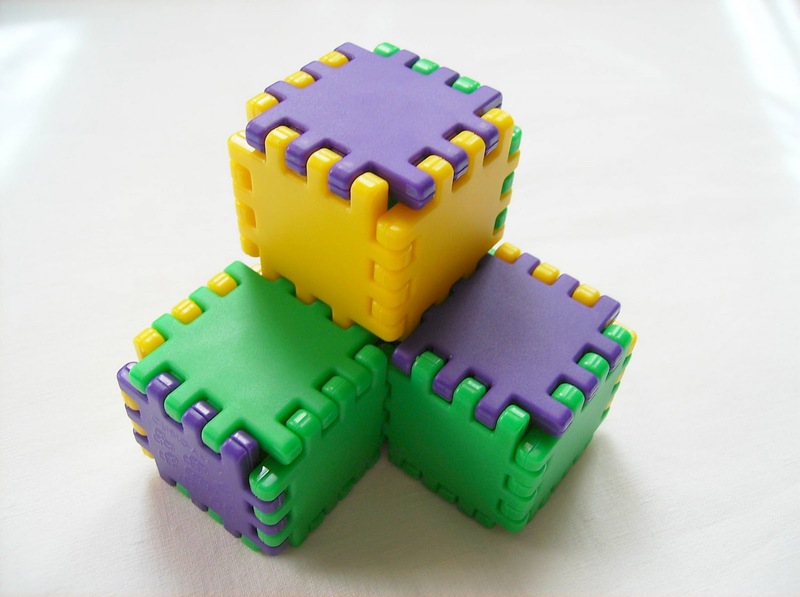 Cubigami7, named like this because you can only make 7 shapes with its 18 pieces. The puzzle can be unfolded to a 6x6 grid and from that configuration, any of the seven shapes can be assembled. The pieces are all linked together by their sides, which varies from one to all four sides (only one piece is linked with others at its four sides). The most common color scheme used is 5 yellow, 5 purple and 8 green, although you can see different schemes used in other countries. It's very easy to manipulate the puzzle. 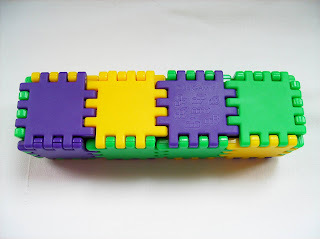 Each linked piece can rotate on its axis up or down and since you don't have any loose pieces, you have to use every one of them in all 7 shapes. However, this fact doesn't make it any easier to assemble all possible shapes. On the contrary, because you have to figure out which pieces to fold and where each one belongs in the shape you're trying to make. Most of the times, a trial and error will get you there, but it's way more fun to visualize the shape first and then work around that image. In conclusion, the Cubigami7 is a nice 3D puzzle. It's a great way to stimulate your 3D thinking and visualization and it's recommended to anyone that likes creative toys with the ability to make different shapes. The Wurmm... and Bronco are two designs by Dutch puzzle inventor Oskar van Deventer, with George Miller making the prototype for the Wurmm. They're essentially Route Finding Puzzles, where the goal is always to find the correct path, usually to set free a piece of the puzzle. 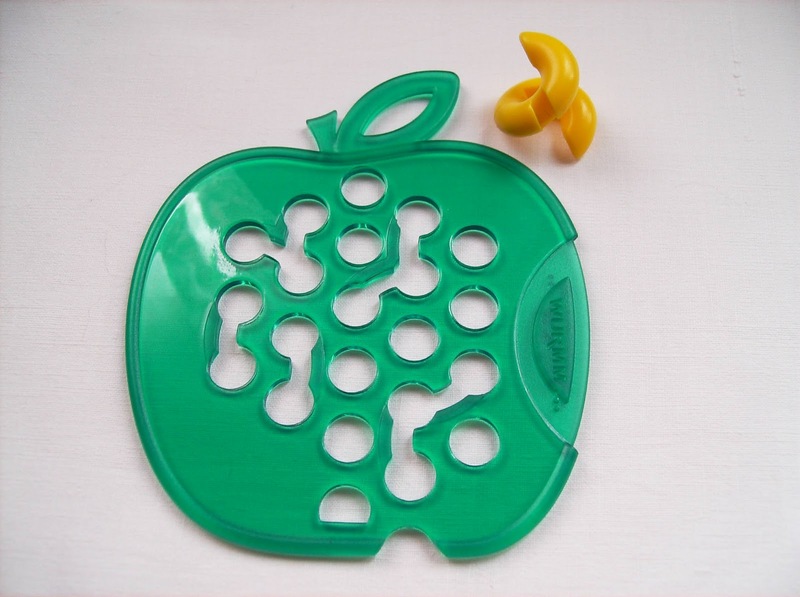 Distributed by Recent Toys since 2008, the puzzle is a shape of a green apple with 22 holes and a worm-like figure. The goal is to free the worm from one of its many starting points to the exit below the apple. In the way, you'll find some holes joined together. This is where you find the eight so called pivot points, where you can rotate your Wurmm to change direction and find the exit point. The puzzle itself isn't that hard to solve. Once you get how direction changes work, you'll eventually find the correct path to free the Wurmm. The concept is a bit similar to the classic plate design, although it's nice to see the puzzle here, with an added twist, like the direction changing ability. It definitely made the puzzle a bit more difficult and fun to solve. 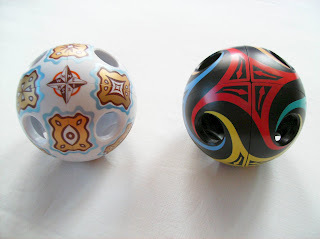 The design is also what differentiates it from the other similar type puzzles. Such a simple idea, and yet nobody thought of that before Oskar did. 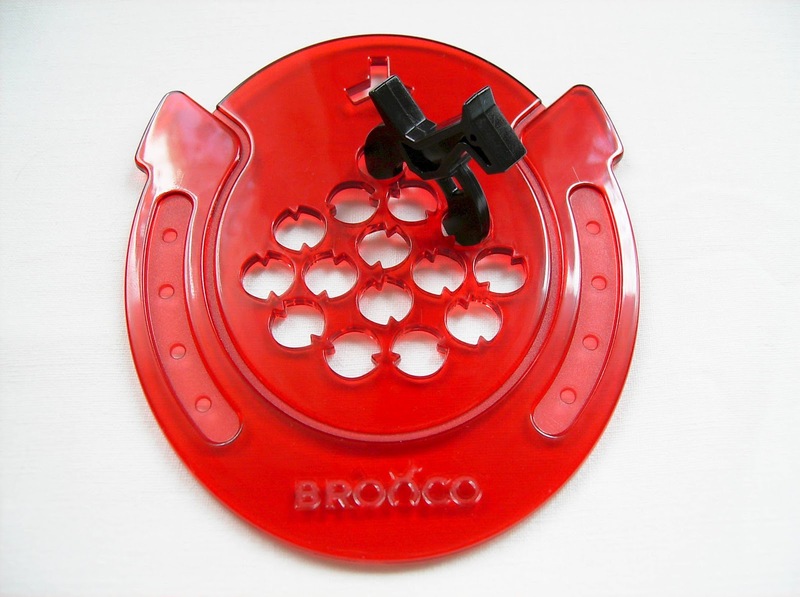 Also distributed by Recent Toys, this time since 2009, Bronco is another Route Finding Puzzle. 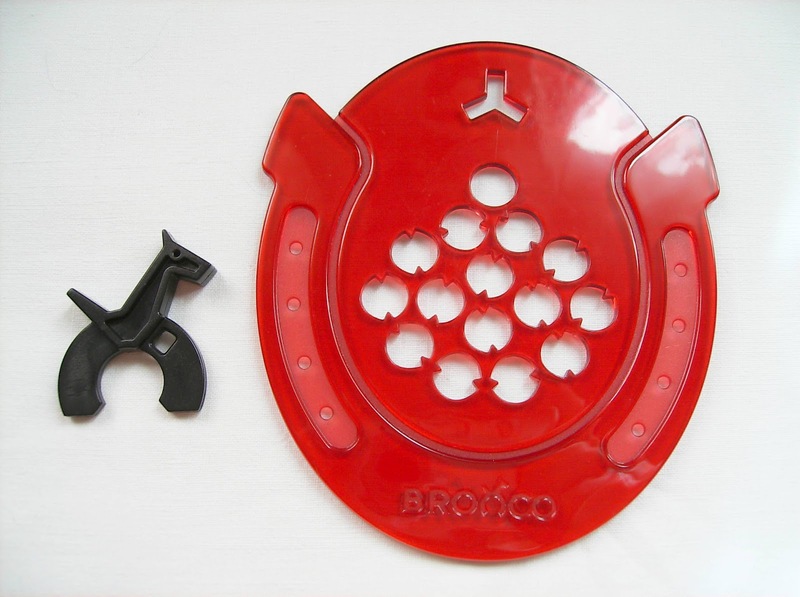 The concept is similar with the Wurmm, but with the Bronco you have a shape of a horseshoe arena with 15 holes and a wild horse figure. Here, you can also have different holes as a starting point. Once you choose one, jump your horse forwards or backwards into a hole and rotate it to an available space. Note that, not every adjacent hole will fit, since each one have a pair of opposite spikes that block certain moves. Once you make it to the last hole, which by the way, is the only one that doesn't have spikes, you can rotate the horse freely and guide it to the escape point. Just like Wurmm, Bronco is a nice use of a simple idea by turning it into a beautiful design, recognizable by everyone. It doesn't provide much of a challenge, as it's much easier compared to Wurmm, but a great collectible for a puzzle lover, though. This is the White DoTS. 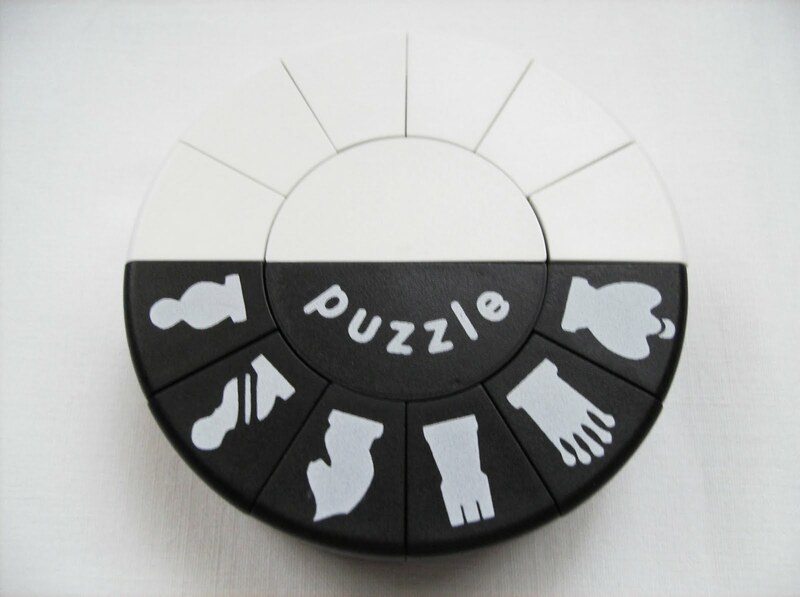 It was developed by the brilliant puzzle inventor Dr. Pantazis Constantine Houlis and was first released for asian markets in late 2009. The white DoTS belongs to a family of puzzles, called the Gravity Puzzles. 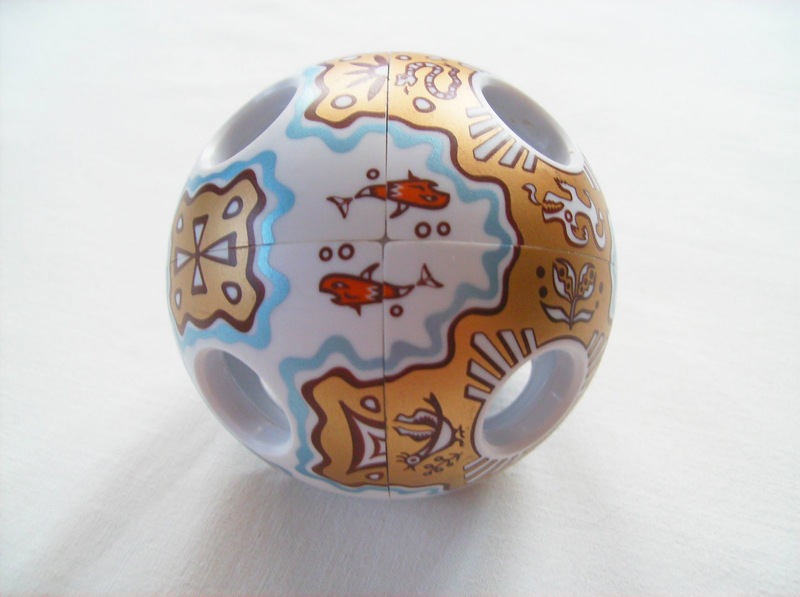 It's called Gravity Puzzles because you're not able to touch the pieces inside the sphere, so you rely only on gravity to act on the puzzle, by rotating the sphere and move one of the five pyramids at a time to the available space. Each pyramid has dots, from 1 to 4, on each of its four sides and it's also dotted at the base. 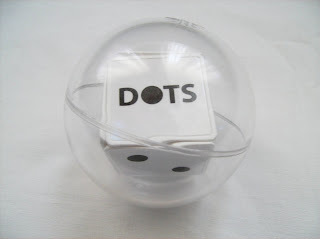 The DoTS is nothing like the Varikon Puzzle and past gravity puzzles. 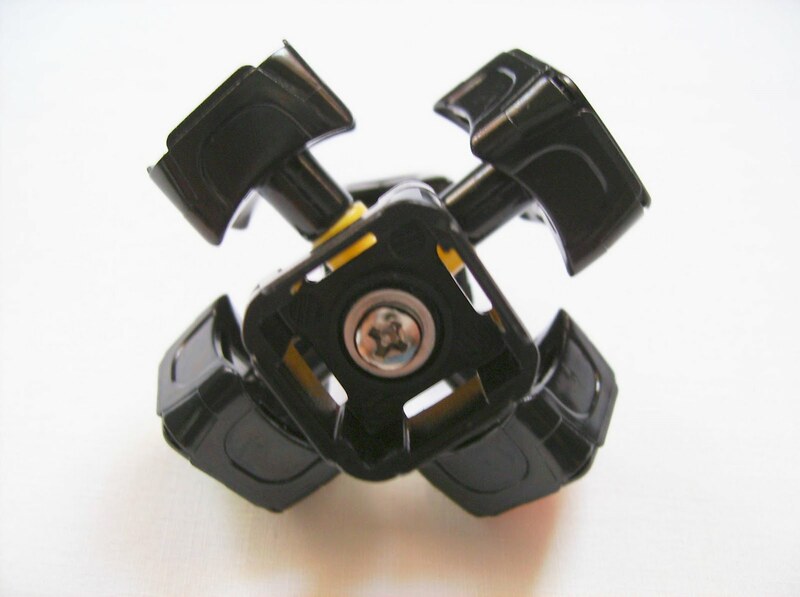 It has rotational gravity movement, or in other words, it combines sliding and shifting, by rotating the pyramid with respect to the puzzle's center. 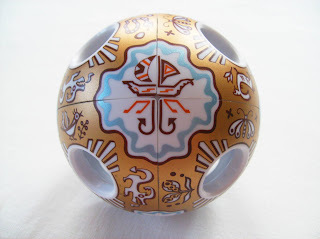 This concept proves that other mediums can also be used to fill the sphere. The Aquadron is a perfect example of this. The design is flawless. The sphere feels just right in the hand, has the appropriate size and weight to maneuver it very easily and is extremely intuitive. You can pick it up for the first time and start playing right away. Easy - For first timers, to get used to the solving process. Start by getting one dot (or any other combination) in every pyramid, when looking from above. Moderate - After you've mastered the easy challenges, try to get the bottom of the pyramids, also in a correct sequence (1,2,3,4). Advanced - Now with all the correct sequences, try to get the 'DoTS' pyramid with the right orientation. For example, with the pyramid of one dot above it. Besides the basic challenges, you can also try your own, like choosing a number (12), where you get the middle dots (4+4+3+1) to match the right sum. 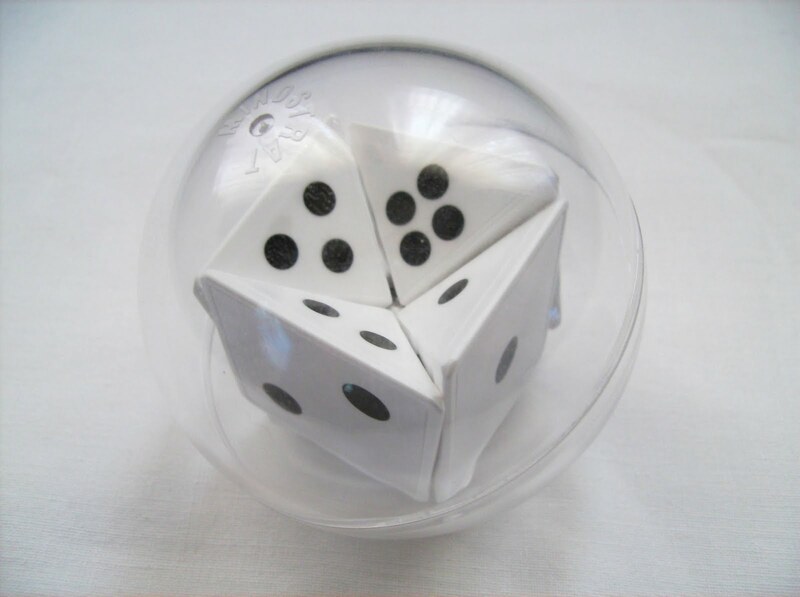 Regarding difficulty, the Cubedron is the harder one in the market right now, because of its parity problems and the DoTS is more recommended for a wider target for its easier challenges. If you want to speedsolve it though, you should choose the Cubedron, for not using stickers on the side of the pyramids, it provides a faster movement. If you're a collector, like myself, I recommend all the designs. Each of them is a different experience and with the new ones coming up, the family is getting bigger. There's a lot of different designs for Pantazis' Gravity Puzzles. However, only a few of them are commercially available, although Pantazis plans to release a few new designs soon. In conclusion, the White DoTS and the Gravity Puzzles in general, are very welcome to the world of puzzles. It's a breath of fresh air to have something out of the ordinary and so original, like you've never seen before. With all the puzzles that have been released lately, many of them are very similar to what we already saw and bring nothing new to the puzzling experience. And with all the new ideas that Pantazis has in mind, stored for us, we can expect many more 'out of this world' concepts in the near future. For now, I only have the White DoTS, but I loved it so much that I plan to get the other ones soon, for my collection. 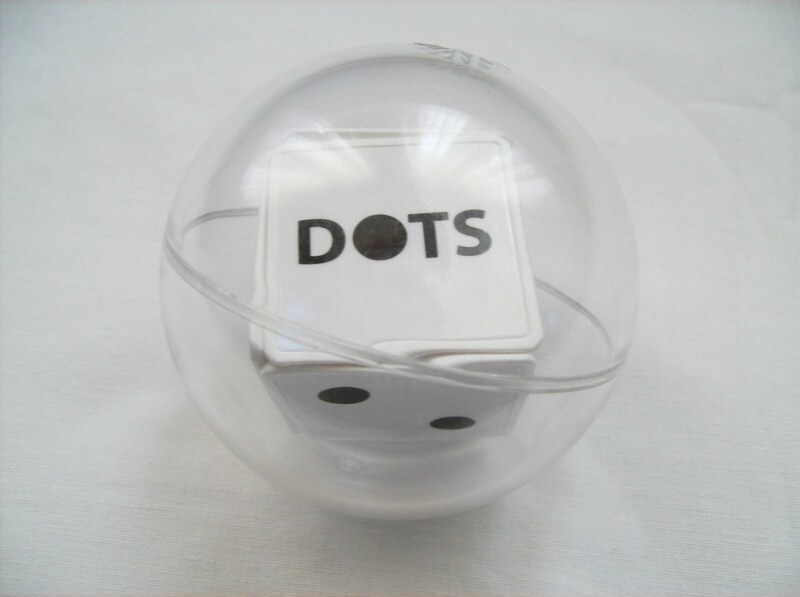 The White DoTS and the other designs are available to purchase online at Mindstrat Puzzles, the inventor's company. Update: The White DoTS has been discontinued and rebranded to The Oginov Tumbler. The Haiyan's Cube - Memory is redesigned, polished, sanded and assembled by the 6 times blindfolded world record holder, Haiyan Zhuang. 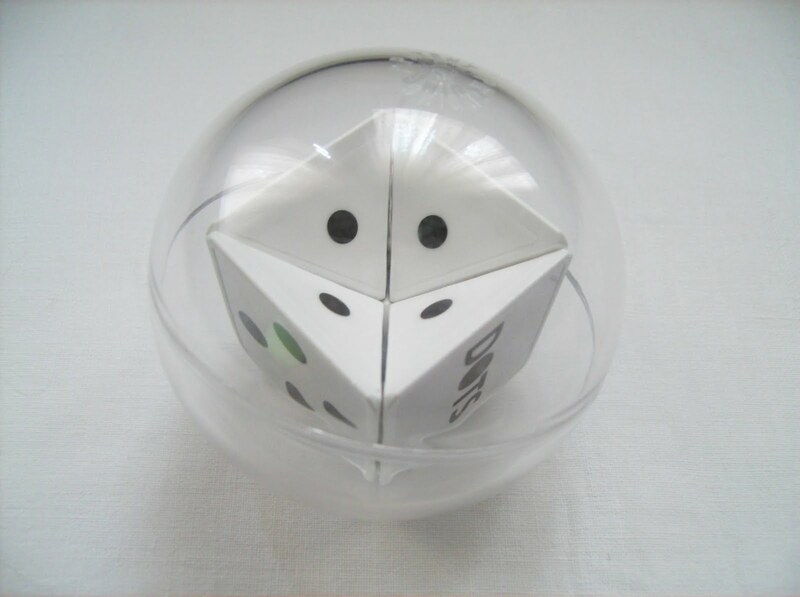 It's a professional speed cube that has very high cutting-corner abilities and turns great. The Memory cube is made from an Alpha V cube, with the major difference that Haiyan spends about 45 minutes to sand it. 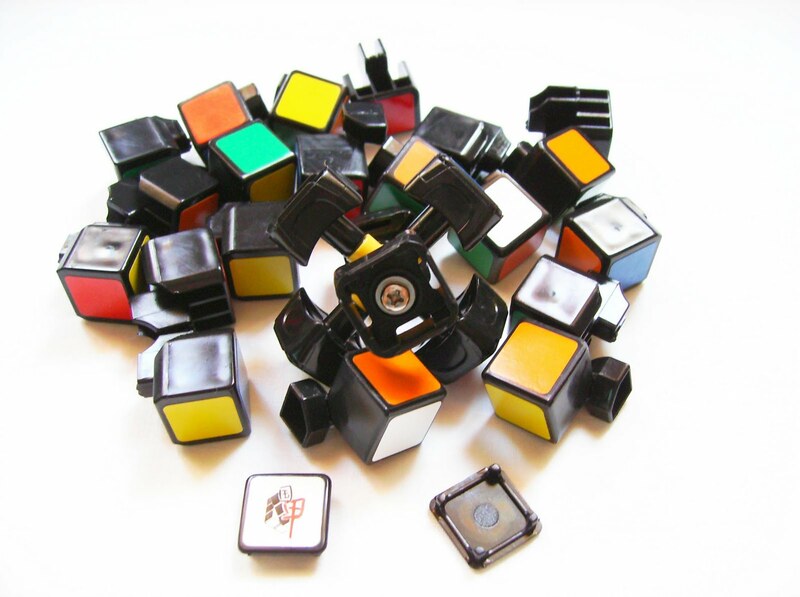 All the edge cubies had their inner corners cut and rounded, which provides a smoother turning and produces much less friction between the pieces. Right out of the box, the cube comes well lubed, with the right tension, but it's adjustable if you like (the center caps can be removed to show the adjusting screws). Although I'm not a speedsolver, I can tell that it's already with the appropriate tension, not too loose that makes it pop constantly, but also not so tight that reduces the turning quality. By the way, I was unable to test the frequency of pops, for reasons stated above, but according to Haiyan, it's very difficult for a cubie to pop during speedsolve. I have made size comparisons with the original Rubik's Cube, whilst turning and cutting-corner quality was made with the Ghost Hand Cube. Regarding size, the Memory Cube is about 2mm thinner than the Rubik's cube. The Ghost Hand Cube was the best turning and cutting-corner cube I had thus far. ...Well, no more. The Memory Cube is by far, much smoother and cuts corners way beyond the point of the one Ghost Hand is capable of. Besides the Memory, the Ghost Hand is the only speedsolving cube I have, so I can only compare with this one, though I can tell when I see a good quality cube and the Memory, fits this category. 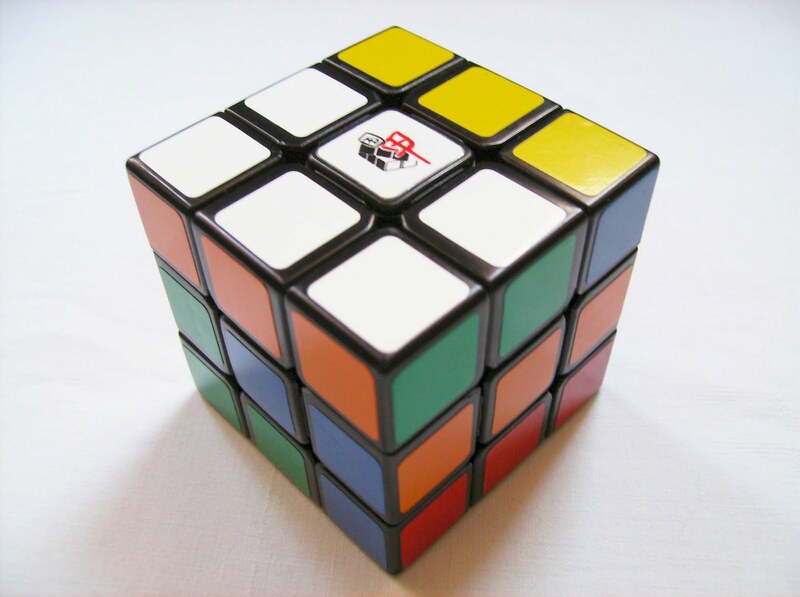 The Stichers used are PVC, with the standard Rubik's scheme (white opposite yellow, red opposite orange and blue opposite green). 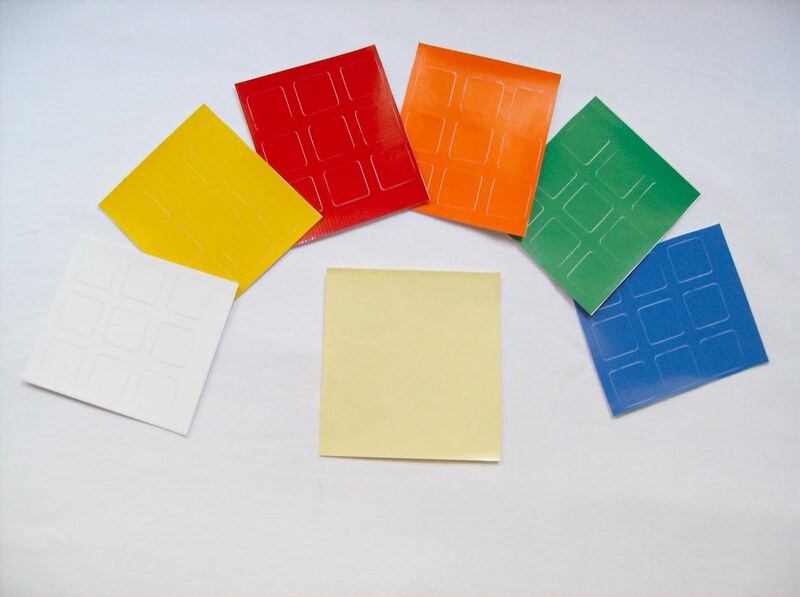 You can purchase a set of replacement stickers for $0.7 when you buy your cube. Just contact Haiyan's site support before you checkout. 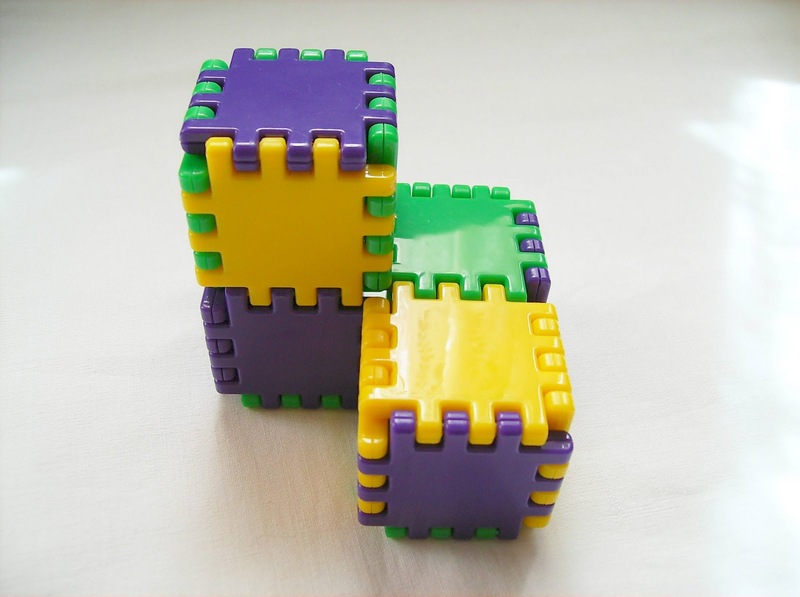 The Memory Cube is available at Haiyan's online store for $25 with free shipping worldwide. And if you're interested in wholesale, you can purchase a minimum of 30 Memory Cubes to get a discount of 70% off of the regular sale price. I love the Haiyan's Memory Cube, it's my favorite cube for solving right now. It isn't like any other cube that I've tried. As I'm not a real speedsolver (my personal best is an astonishing 2:31), it may not be so impressive to hear this, but it's actually an amazing cube with an extreme high quality. Also, these are the actual cubes that Haiyan uses for his competitions and he makes sure that every one of them fits his high standards. If you're a speedsolver, I can highly recommend you this cube. You will not be disappointed. 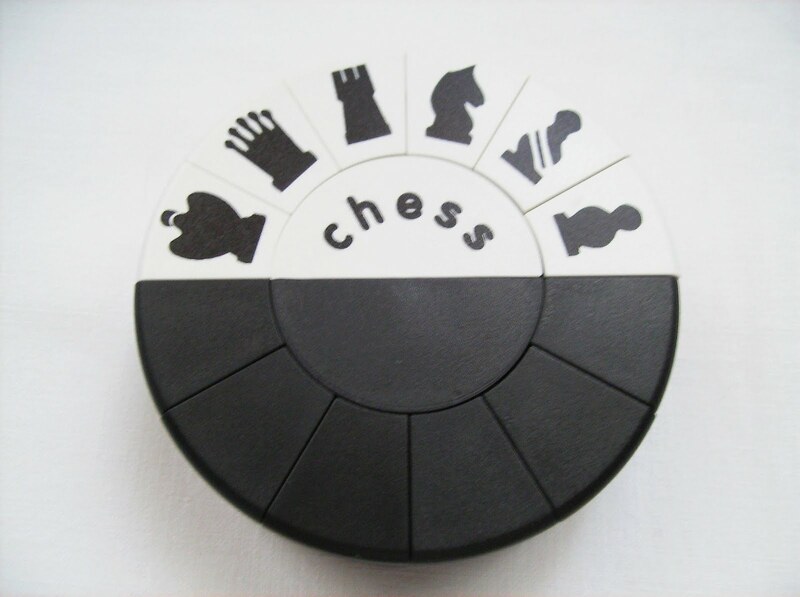 The Chess Puck is my 12th Random Pick from My Collection. 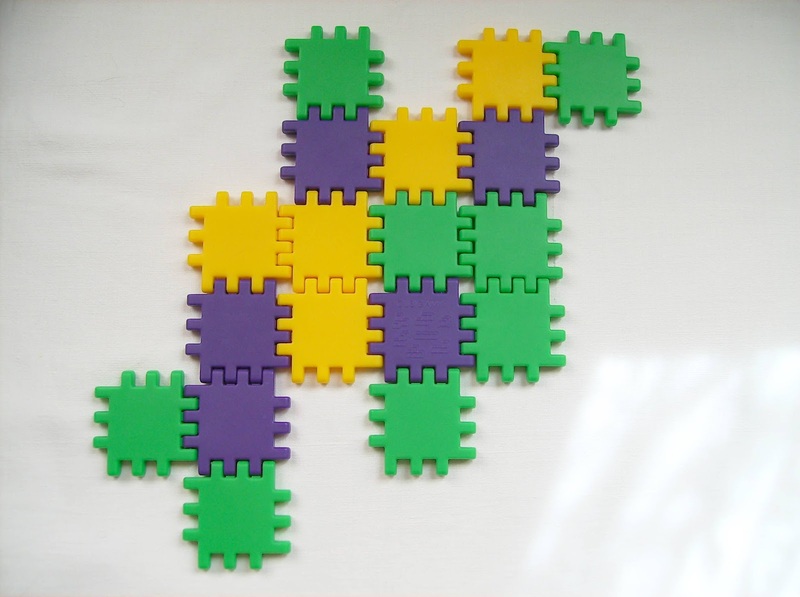 The puzzle was invented by Geza Csomos, Udulo Mszmp and Zoltan Pataki in 1991. The name comes for its resemblance and exact measures of a real hockey puck. 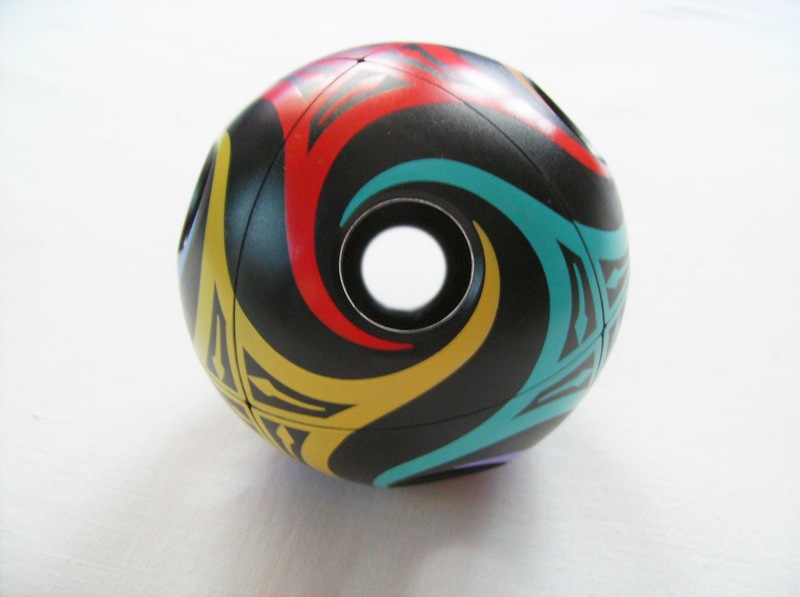 It has 12 segments around a sliced center disc and you play it by rotating these segments, six at a time in 180º turns. 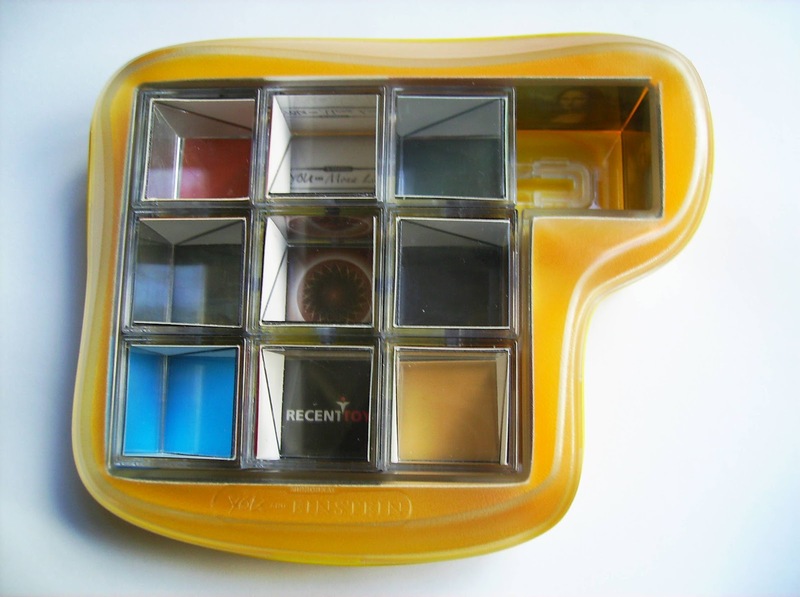 It plays like a Super Square-1, only with one layer or a Mag-Nif Saturn, but with 12 segmens instead of 8. 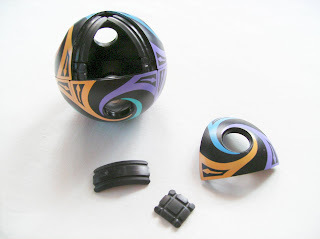 - The first challenge is just to get the black segments in one half and the white ones in the other half. No need to worry about correct order, just blacks and whites. 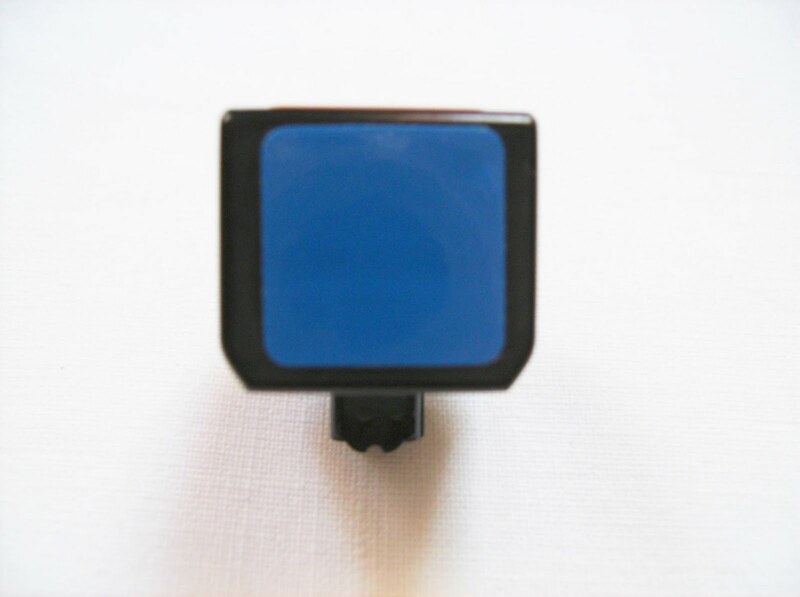 - The second challenge is similar to the one you find on the Half Black Rainbow Puck. 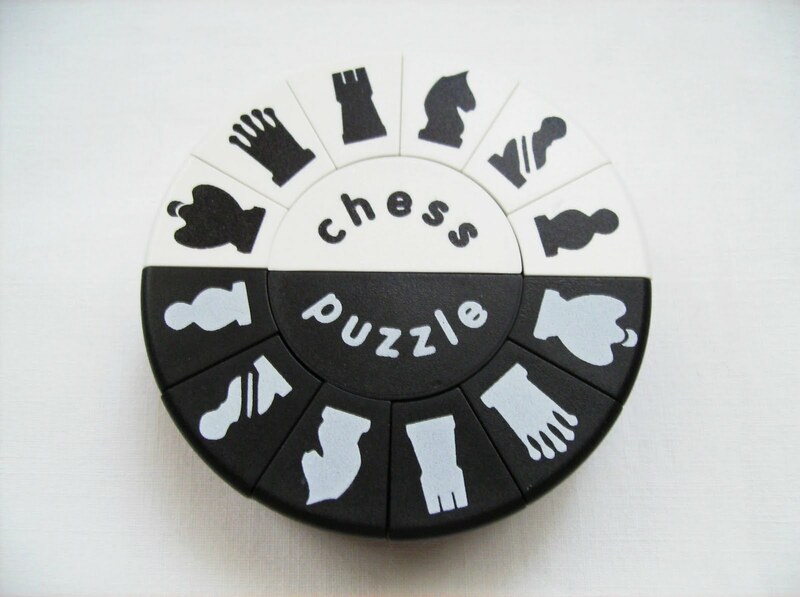 Get one half of the puzzle with the correct order of either the black or the white chess pieces and the other half with just the plain black or white segments, depending on the one you used for the other half. - In the third challenge, you can also try a similar one found on the Blue & White and Black & Yellow Pucks. Just alternate all 12 segments between black and white. 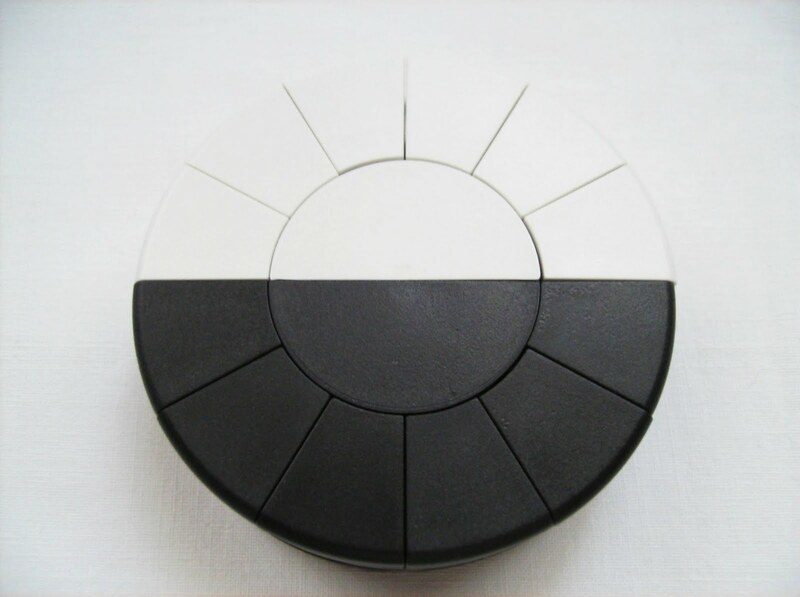 - Finally, in the fourth challenge, try to order the plain black and white segments in a two by two sequence. 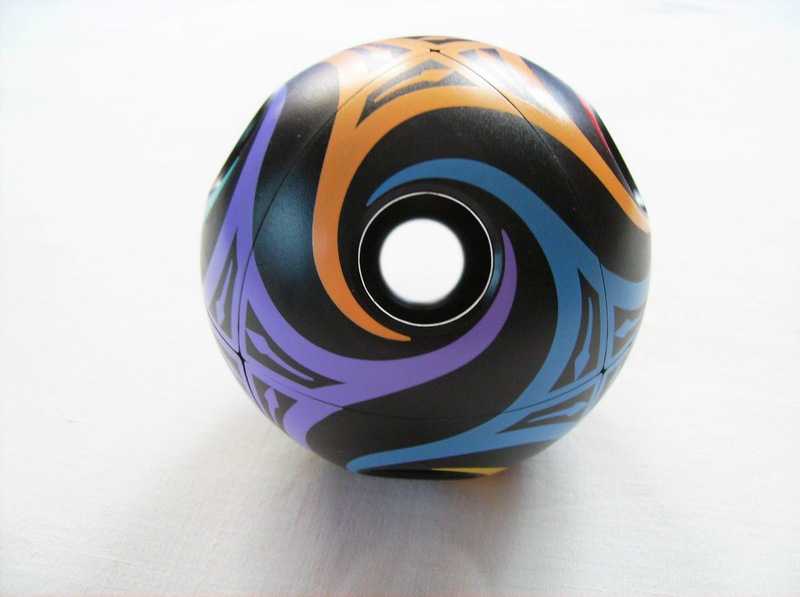 In other words, try to make a similar pattern like the Radioactive Puck, but with white instead of orange. You can still find a lot of designs for sale. A few of them are available from the company that manufactures them, Whole Systems Design, Inc. and many more from Milan's Store and PuzzleShop.de. The Ring Lock, designed by Jean Claude Constantin, was released in 2005 (also known as Ringschloss). It's among the long family of the 'Trick Locks', 'Take-Apart' or 'Hidden Mechanism' puzzles. 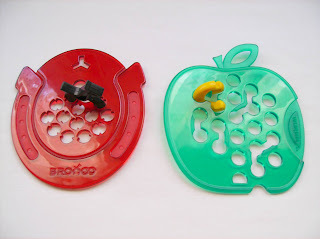 There's a wide variety of these puzzles with very clever mechanisms to open them. The presentation of the puzzle is one of the most interesting found in the Trick Lock's family. 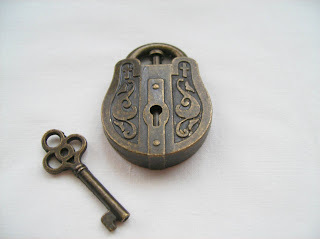 It's made to look like an antique lock, with the fading golden metal and the floral motif carvings. The internal build quality is something to worry about though, because the metal pin inside that allows the lock to open, is extremely thin and will brake with any extra force you apply on it. And believe me, if you have a few people playing with it like I had, it's going to brake. Welding isn't going to work, because it will make the piece a bit more thick and thus, not allowing the 'ring' to move inside. I managed to fix it with a little bit of super glue and until now it has withstand further solving attempts. 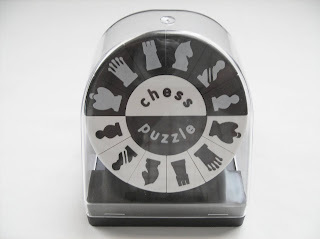 Below is a list of links with stores and more information about this type of puzzles. 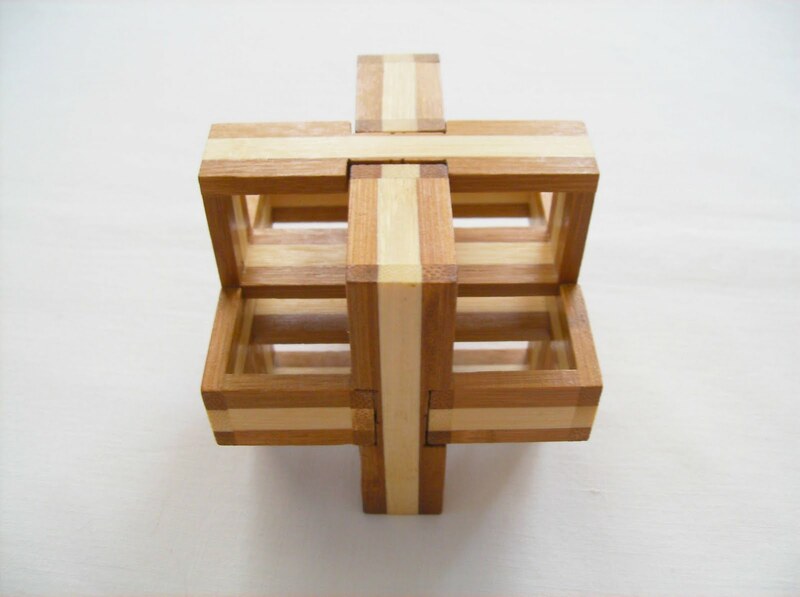 This particular Bamboo Puzzle is part of a four puzzle collection released by 'mi Toys' and belongs to their dedicated 'mimi Puzzles' brand, with this one being the fourth and last in the series. 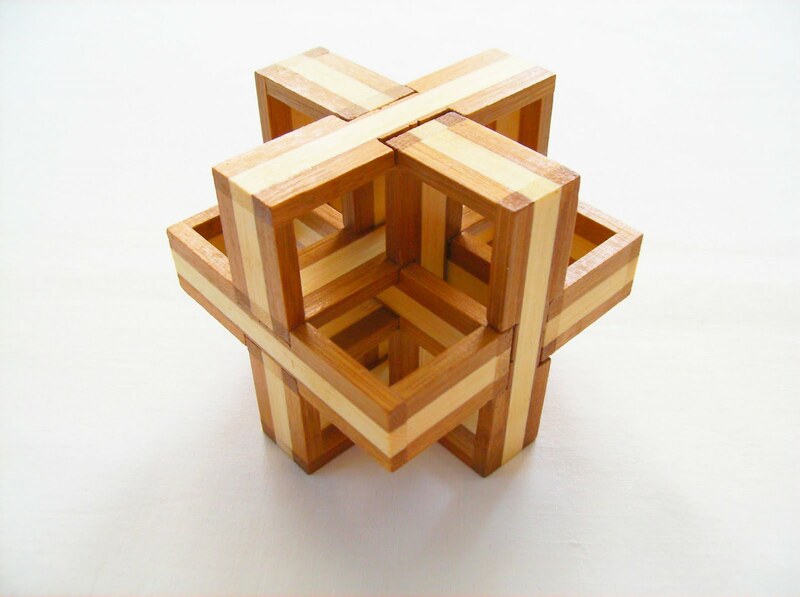 Bamboo is a great looking material to build puzzles, although it's something you don't see very often. There were used two Bamboo colors and as you can see, it gives an amazing visual effect with the stripes pattern. 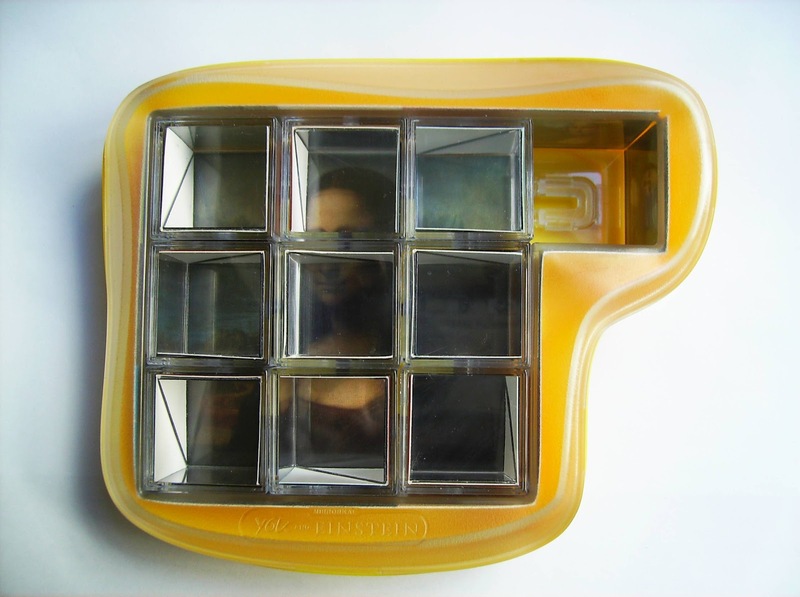 The interior of the puzzle is completely hollow, with six rectangular pieces (four identical and two other "key" pieces), holding together this beautiful shape. The Goal? 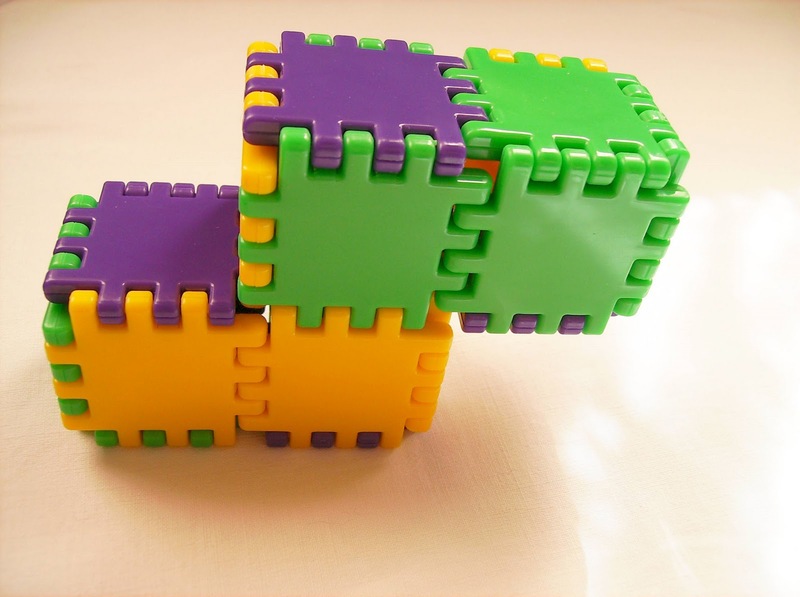 - It's simple, like any other interlocking puzzles, disassemble and then assemble it back to it's original form. There's five degrees of difficulty, from 1* to 5*, but only three of them (2*, 3* and 4*) are used to categorize the four puzzles though. The one showed here is difficulty 3*. This series is marketed as "3D puzzles made of environment friendly material", and even the packaging used is from recycled cardboard paper. 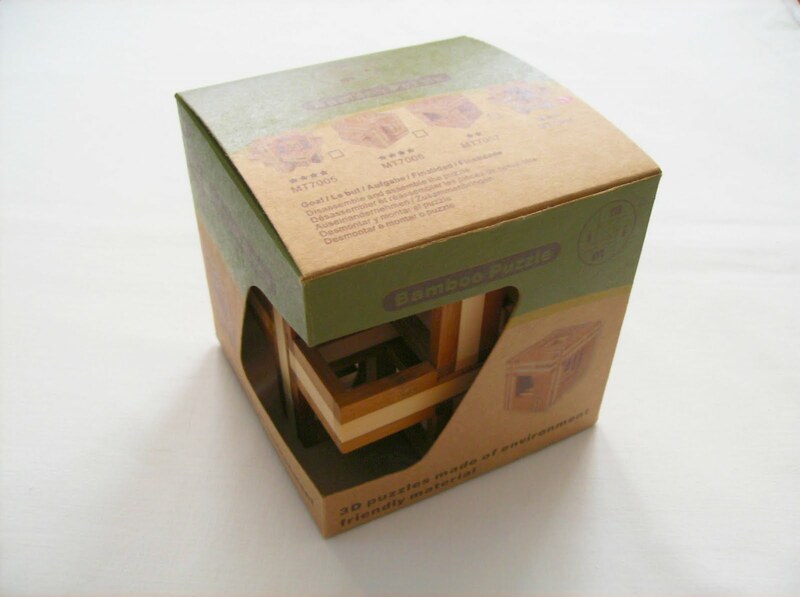 The Bamboo Puzzle and the other three can be found in the German toys-for-all online shop. 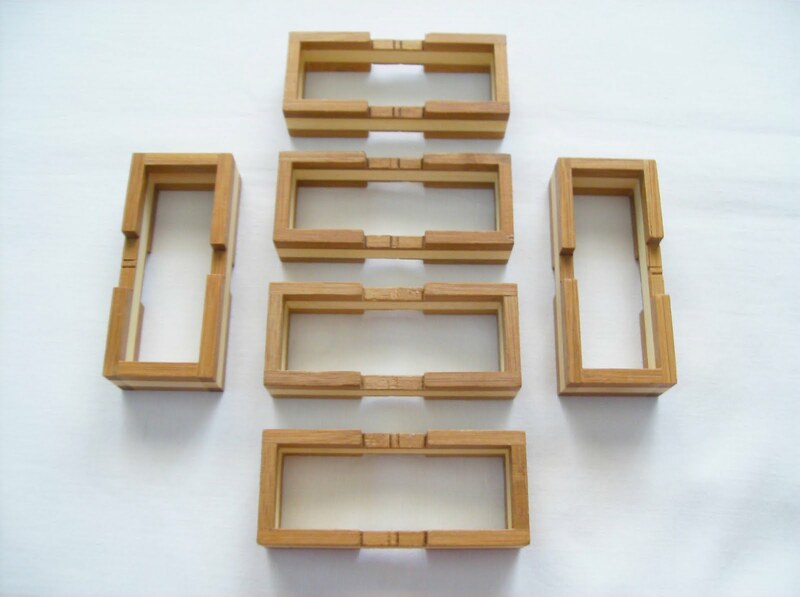 You can also find there a few other similar bamboo puzzles. A curiosity about Bamboo: Some people might not know this, but the Bamboo plant isn't a wood, it's actually a grass. It is considered a renewable resource for being one of the fastest-growing plants on the planet, reaching its maturity in only three years.